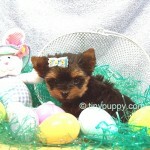 Micro Bandit Teacup Yorkie Puppy – Championship Sired! 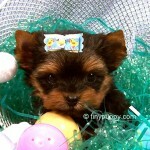 Our Micro Yorkie Baby Bandit is as cute as can be. I just love those eyes and brows. 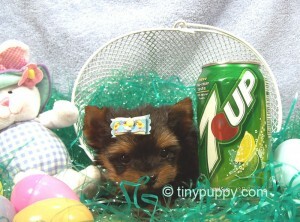 Baby Bandit is only 19 oz at 9 weeks of age. How tiny! Bandit is very loving and loves to cuddle. He is loving and would be very happy to go everywhere with you. 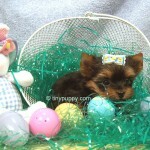 He is ready for Easter and a nice spring day. Bandits Daddy is an APRI Champion and he is just so beautiful.